The one plus 6t I a new mobile phone from one plus. It is the next generation of the one plus 6 line will be available on 1 November. Oneplus will feature a 6.4" Display, in the display screen lock technology night space camera feature. 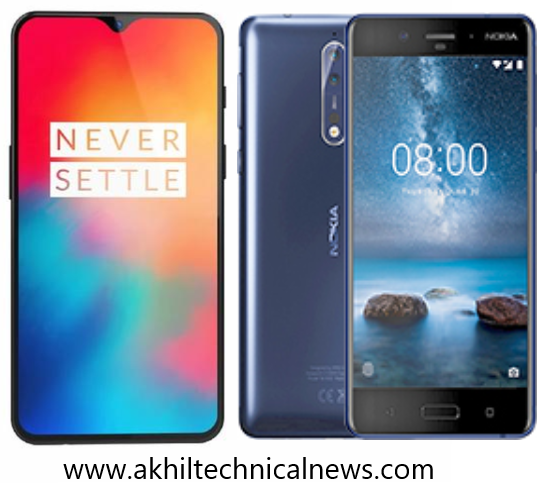 The Nokia 8 is a high-end Nokia branded smart phone running the Android operating system. in the impressive display and good battery backup with quick charging and great configuration and excellent camera. Dual sim (Nano sim dual standby ), Type Display optic AMOLED captive touchscreen, size 6.41 inches, Resolution 1080x2340 pixel, and multitouch. the one plus 6t 6 GB ram and 128 GB storage price 37999 AND 8 GB ram 128 GB storage price 34999 and smartphone Amazon exclusive. The Nokia 8 in 64GB + 4GB price 30872 in Amazon.